Most of my college days this is what my mom as well as our house helper commonly serve if they ran out of ideas on what to cook. It was so easy for them as preparing this is next to none and it is also very convenient as we have a chayote (sayote) plant at our backyard which do bear a lot of this vegetable. During those times I remember I hated this vegetable just imagine having this for at least once a week for three years, I guess even if it is your favourite you’ll get tired of the taste. Now it’s a bit different as I am craving for this dish (sometimes), I guess I got used to the taste after that 3 year torture to my taste buds but it is hard to find here in New Zealand and they come only during a specific season, they are also expensive especially when you compare it at Php 5.00 a kilo during my time in the Philippines versus NZ$1.25 (Php 43.00) a piece here. But yes things had changed and sometimes you crave for things you really did not like when you were younger, even if it is exorbitantly priced you’re still glad to pay for it now. This is just one example and there are lots of food items that I did not really enjoy before but now I am glad to pay more just to have a taste of it. Did that ever happened to you, where in what you had hated before you started enjoying now? In a wok add oil and fry pork pieces until golden brown and crispy. Remove pork then set aside. Add shallots and garlic then stir fry until shallots becomes soft. 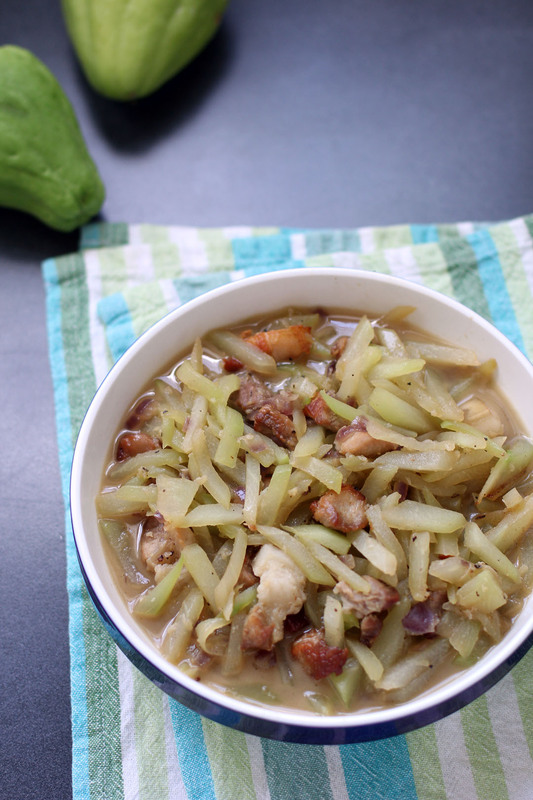 Add chicken stock and pork bring to a boil and simmer for 5 minutes or until chayote is tender. Season with fish sauce/sea salt and freshly ground black pepper. 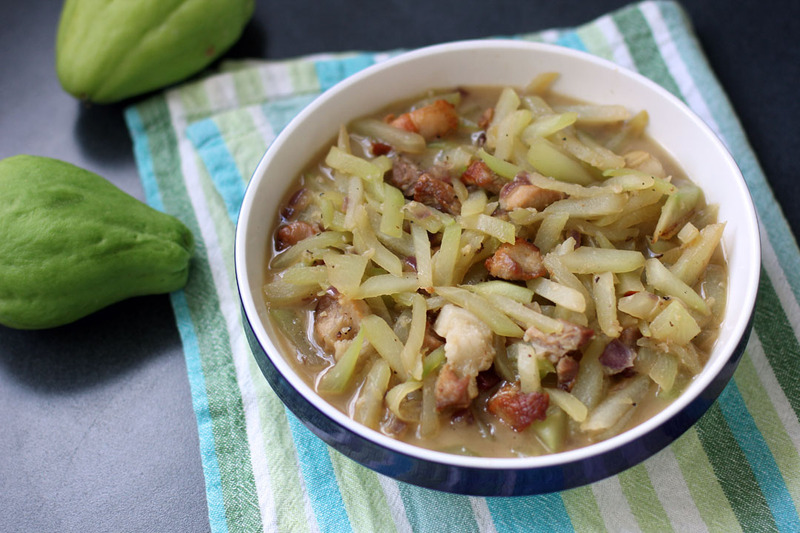 When I lived in Santo Domingo, chayote seems to be served as a side on every plate. Your dish sounds very flavorful with the addition of pork belly. I’ve never even tried chayote before, but it looks interesting. I wonder what it’s like. I am not familiar with chayote, but it looks delicious. Never tried this dish before, but again it looks so comforting & promises to be a truly healthy broth. I must look out for it at the Asian grocers. Savoury apple, sounds so good!